Canon unleashed a torrent of announcements today, but the two cameras that will probably be of most interest to TDS members are the new EOS 40D DSLR and the PowerShot G9 compact. Both cameras are updates that are true improvements over their predecessors. 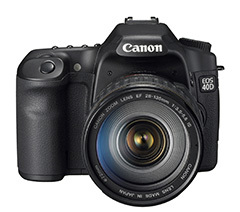 Canon states about the 40D: "From the camera's newly enhanced, 10.1-megapixel CMOS imaging sensor (designed and manufactured by Canon) and its proprietary and super-efficient DIGIC III image processor, to its completely redesigned autofocus sensor and fast, 6.5 frame-per-second (fps) continuous shooting capability (for bursts of up to 75 Large/Fine JPEGs or 17 RAW images), the EOS 40D SLR puts the fun in functionality and makes serious photo business a positive pleasure." I think Canon shooters are going to love the 6.5 fps. 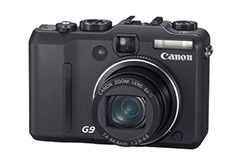 On the compact side, the PowerShot G9 packs a ton of features into it's handsome body, including the return of RAW: "The PowerShot G9 digital camera features the same matte black, retro-hip design that G-series fans have come to appreciate, with a simplified control layout that is versatile yet easy to understand. This camera is loaded with Canon's latest and most advanced technologies, while raising the bar with the addition of RAW Mode, usually reserved for larger and more expensive SLR cameras. Advanced photographers also have the option of using RAW+JPEG simultaneous capture functionality, giving photographers the best of both worlds - JPEGs for immediate use and RAW images for faithful image reproduction, and extensive, non-destructive image editing capability." I checked out images of the camera on the Canon site. Nice! I wish they had a picture looking down onto the LCD panel and buttons on the top of the camera. The new layout on the back also includes a new button marked AF-ON. I can't wait for a full review of this camera.